I wish for Fences to allow you to chose where the tittle/name bar is located for each fence. So you could chose if it is located on the top of the fence or the bottom. Also, I wish you could change the color of each individual fence. Then, I would wish you could have the Fence folder portals (for folders that aren't on the desktop) be selectable to be the default fence for new icons/files on the desktop so they don't go to the desktop but rather the folder in the portal instead. Very useful for those who need to not store stuff on their very small 128GB SSD. And last, (Just a shot in the dark here) have a system where your fence layout can be synced to an account for use with multiple PCs. 1. Make "Configure Fences" Not the top item for the desktop context menu item. You also seem to take over the native view and sort options of the context menu. All the fences items should be under a sub menu. 2. Make "Layout Snapshots" actually work. Has never, ever worked. Also give it a better interface to manage snapshots. Also there is no management for the "remember stuff for different resolutions"
3. Fix whatever the stupid bug is that makes dragging an icon into a fence just place it on the desktop in that area, and not actually in the fence group. 4. Fix the bug where sometimes icons in a fence go entirely missing? 6. Improve the organization of your Setting/Configure interface. Things are kind of all over, and there are too many "links" that just have some info in a popup modal. I will give you a +1 on having the animation pictures of what the thing on the page configures, that is something more apps need to copy. 7. Spend some time giving some love to inner workings of the Folder Portal system. Its really great... except when it breaks. Which is often. and silently. Seriously, throw some error text in an empty folder fence when the source folder its points at doesnt exist, dont just show an empty fence. 8. Allow bottom fence titles for fences that are not snapped to the top of the screen. Allow top titles for fences that ARE snaped to the top of the screen. 9. Allow per fence icon size alteration for non-folder fences. Attempting this right now bubbles the action to the OS, and changes all of them, including desktop icons. Windows 10 Multiple Desktop Support - Ability to select/place individual fences per virtual desktop. Can you say more about what changing the GUI Z-order means? People who create Windows shells and GUIs in particular often deal with the limitations of 'z-order' which is the layering designed into the Windows concept that sees the desktop wallpaper drawn first....then icons and gadgets etc second...then inactive windows third and active [focused] windows last....and pop-over warnings etc on top of them even. Mouse hover is great idea - see what's inside folder without opening it. I'm using Windows Explorer enhancement QTabBar and there it is available, look below (mouse pointer is not captured). Setting it up takes a bit of effort but once done it works pretty well. Basically you are setting a snapshot on a network and on-load the local Fences instance calls it. I have two monitors connected to my PC. Imagine I have 4 desktop pages, named 1 <-> 2 <-> 3 <-> 4 . In a normal situation, I have on my left monitor the desktop page 1, and one my right monitor the destop page 2. Right now, with Fences, when I switch between desktop pages, my left monitor goes from 1 to 3, and my right monitor goes from 2 to 4. It's not useful for me since I only need 2 desktop pages. What I would need it just a way to switch between those 2 pages : my left monitor would go from 1 to 2, and my right monitor from 2 to 1. It would be useful when I turn off one of my screen. It would be nice to be able to left click once to select an icon (link, folder, executable) on a per fence basis. For example, a fence that has links to executables could act as toolbar. Why windows doesn’t have this feature on a folder by folder option, is beyond me. The only reason I am returning customer is, they fail to give me the desktop environment I want (not necessarily need). Fences one of the best additions to the desktop as is but some of the suggestions here would be a great addition. Glad you are still actively working on a great program. Having the ability to set your title bar a certain size on your desktop, but as you place your mouse pointer on the title bar, it expands to the left or right given to the placement of the title bar, to a certain point of 10 icons across and down displaying all icons under that title. Making it less scrolling and quicker and easier way to find that certain application. * Allow having a different set of fences per virtual Desktop on Windows 10. Left and right mouse-wheel clicks to navigate backwards and forwards in a folder portal's directory history, as in windows explorer or most web browsers. Or at least a left wheel click to move "up" as though you had clicked the arrow or hit the backspace key. For mouse-heavy users, that up arrow is a moving target based on the length of the current directory's name. The wheel click sounds easiest since there's a binding for that function on the backspace key already, but honestly I'd settle for an option to left align the up arrow in the title bar, next to the hamburger. Great idea - each virtual desktop to have separate Fences. Also - mouse clicks - moving back/forward - this allows much more productivity, agree. 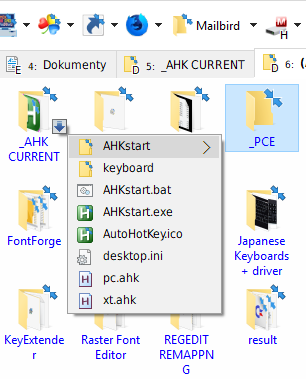 BTW: I have all programmed by AutoHotKey and it is great for more than 3 button mouse. I love Fences but the automatic fencing of new shortcuts feels pretty limited. The "rules" functionality treats all shortcuts & all links the same. If there were two additional options I'd basically never have to move shortcuts around myself. And they're really easy to implement, I think. 2. For shortcuts, I should be able to set different rules depending on the location which the shortcut points to. I.E. Shortcut to "C:\Program Files\*" goes to Fence 1, etc. Tabbed fences have been mentioned but I like the idea of one collapsed bar with one or more tabs that rules out the selected tab when it is mouse over. Selectable whether taba are side by side horizontally or in a vehicle column and then which direction, up down left right, that the fence unrolls to. I would like to have the ability to have single-click activation of applications (like a pinned task bar item), either on a app-by-app basis, or by-fence. My issues are the age-old problems of accessing a fence when it's buried by a multitude of program windows. I have a multi-monitor setup and would like to be able to easily clone a fence so that I can have another copy on a different monitor. Also, using Start10, I often access a fence under All Programs with the Start Menu. But the order of the items within the fence group can't be reordered. My fence is ordered by name, so I wish the items in the start menu were the same way. 1. Toggle Auto-hide Taskbar when quick-hide is toggled. 2. Toggle windows background to black. With these 2 features I can quick-hide everything and just have my extra monitors turn black, without turning off my screens (which isn't always what you want. Very useful feature will be going folder up by double click in Fences Folder Portal. Problem of going folder up is that folder names are centered, so with different name length must to be clicked on other place. Outside Fences Folder Portal, so desktop or Fence double click can leave its function quick hide. This would be killer for me. It would help me do something close to OSX (push other windows aside to give desktop access, then put the windows back exactly where they were) and it is frustrating every time I want that feature and don't have it. Also performance is driving me nuts. I haven't gone through all the troubleshooting steps yet, but performance has been a problem for me for years. I'm on a 4k monitor with about 300 icons. I could move things to folders, but then that's kind of what fences is for. For me, fences enables my pile-style of organization and memory. MS has been sitting on their hands without making any desktop advances for years. Definitely an option to disable the fences snapping feature when resizing them, as if you are trying to be pixel precise it is impossible a lot of times. Wow, this reminded me of a similar product that was part of the old Lotus SmartSuite called SmartCenter I think. Anyway, same concept of dockable "folders" but Lotus took the analogy from those old hanging file drawers, where what Stardock calls a fence equated to a drawer, and inside that "drawer" could be multiple sections analogous to large hanging folders, each of which could contain multiple application links, or files, or even folders. See the image stored on Wikipedia here: https://goo.gl/images/oDAwAh - specifically the left columnar window. Note the purple, blue, red, crimson, green, etc "bars" at the bottom of the column? Clicking on one of these would "expand" the "hanging folder" to show you what was inside. Categories (Manually created) with unique associated files in each. I might be misunderstanding, but this might be close to onenote if onenote could also contain / represent your file system. I did some serious digging. I found that one can disable auto-arrange in Windows 10, so a folder could hold and arrange files like your desktop can. I decided that a "desktop" within a window would be a cool solution, maybe someone could leverage Windows 10's virtual desktops for that. MS (and Stardock) has been working on "Sets" where you combine applications together into a tabbed window, but I don't think that is helpful for multitasking as you only see one program at a time. Two top contender alternatives that I found would be: Nimi Places and Sideslide. Sideslide provides virtual workspaces where you can store related things in a variety of manners, but I have found the learning curve steep and the graphics are a bit off putting to me.